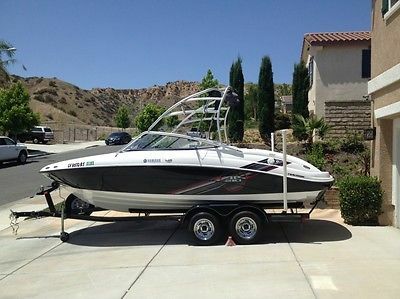 2009 Yamaha AR 210 wake board boat. This is a Great Family boat with 71 hours. Easy to tow. Easy to Drive. Nothing beats a Jet boat for performance. 110 HP 1052 CC Twin Jet Engines Cobra Venom Ultimate Fins, JBL AM /FM CD Radio, 250 watt Power Amp, Tower Speakers, Color Chart Plotter/ Fish Finder, Underwater transom and Cockpit Lighting, New Blacktip Mats Full Boat, Keel Guard, Wash Down Pump, Bimini Top Extension, Dual Battery with Switch, All the life jackets and items you would ever need included. Never touched Salt Water.